Dusty star-forming galaxies (DSFGs) are found in abundance in the early universe. They are especially bright because they are experiencing a large burst of high-rate star formation. Since they are mainly at higher redshifts, we are seeing them well in the past; the high star formation rates occur typically during the early life of a galaxy. The optical light from new and existing stars in such galaxies is heavily absorbed by interstellar dust interior to the galaxy. The dust is quite cold, normally well below 100 Kelvins. It reradiates the absorbed energy thermally at low temperatures. As a result the galaxy becomes bright in the infrared and far infrared portions of the spectrum. Dark matter has two roles here. First of all, each dusty star-forming galaxy would have formed from a “halo” dominated by dark matter. Secondly, dark matter lenses magnify the DSFGs significantly, allowing us to observe them and get decent measurements in the first place. An international team of 27 astronomers has observed half a dozen DSFGs at 3.6 micron and 4.5 micron infrared wavelengths with the space-borne Spitzer telescope. These objects were originally identified at far infrared wavelengths with the Herschel telescope. Combining the infrared and far infrared measurements allows the researchers to determine the galaxy stellar masses and the star formation rates. The six DSFGs observed by the team have redshifts ranging from 1.0 to 3.3 (corresponding to look back times of roughly 8 to 12 billion years). Each of the 6 DSFGs has been magnified by “Einstein” lenses. The lensing effect is due to intervening foreground galaxies, which are also dominated by dark matter, and thus possessing sufficient gravitational fields that are able to significantly deflect and magnify the DSFG images. Each of the 6 DSFGs is therefore magnified by a lens that is mostly dark. The lenses can result in the images of the DSFGs appearing as ring-shaped or arc-shaped. Multiple images are also possible. The magnification factors are quite large, ranging from a factor of 4 to a factor of more than 16 times. (Without dark matter’s contribution the magnification would be very much less). It is a delicate process to subtract out the foreground galaxy, which is much brighter. The authors build a model for the foreground galaxy light profile and gravitational lensing effect in each case. They remove the light from the foreground galaxy computationally in order to reveal the residual light from the background DSFG. And they calculate the magnification factors so that they can determine the intrinsic luminosity of the DSFGs. The stellar masses for these 6 DSFGs are found to be in the range of 80 to 400 billion solar masses, and their star formation rates are in the range of 100 to 500 solar masses per year. One of the 6 galaxies, nicknamed HLock12, is shown in the Spitzer infrared image below, along with the foreground galaxy. The model of the foreground galaxy is subtracted out, such that in the rightmost panes, the DSFG image is more apparent. There are two rows of images, the top row shows measurements at 3.6 microns, and the bottom row is for observations at 4.5 microns. This particular DSFG among the six was found to have a stellar mass of 300 billion solar masses and a total mass in dust of 3 billion solar masses. So the dust component is just about 1% of the stellar component. The estimated star formation rate is 500 solar masses per year, which is hundreds of times larger than the current star formation rate in our own Milky Way galaxy. It is only because of the significant magnification through gravitational lensing (“dark lenses”) that researchers are able to obtain good measurements of these DSFGs. This lensing due to intervening dark matter allows astronomers to advance our understanding of galaxy formation and early evolution, much more quickly than would otherwise be possible. The figure 6 is from the paper referenced below. 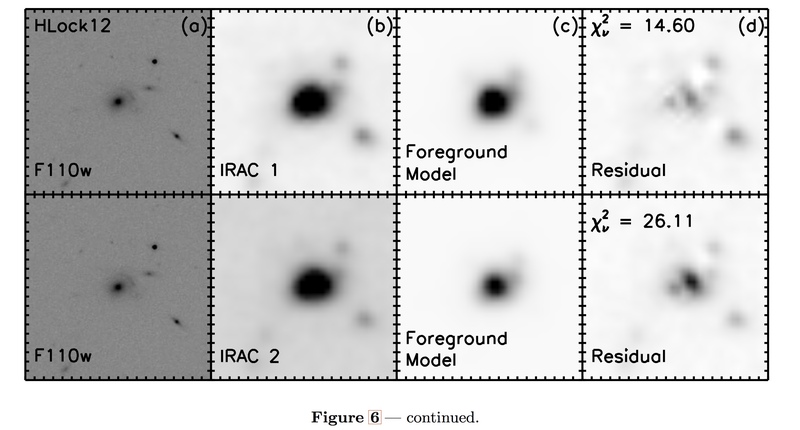 The top row shows (a) a Hubble telescope image of the field in the near infrared at 1.1 microns, and (b) the field at 3.6 microns from the Spitzer telescope. The arc is quite visible in the Hubble image in the upper right quadrant just adjacent to the foreground galaxy in the center. The model for the foreground galaxy is in column (c) and after subtraction the background galaxy image is in column (d), along with several other faint objects. The corresponding images in the bottom row are from Spitzer observations at 4.5 microns. This entry was posted on Sunday, June 14th, 2015 at 6:16 pm	and tagged with dark lenses, Dark matter, DSFGs, dusty star-forming galaxies, early galaxies, Einstein ring, galaxy formation, gravitational lensing, starbursts and posted in Dark Matter. You can follow any responses to this entry through the RSS 2.0 feed.